Harvest Villas is a 55+ community located in South Jordan, Utah. This alluring active adult neighborhood will be comprised of 76 attached homes upon its completion, giving the area a quaint feel. Homes here are available on a new construction basis, giving homebuyers plenty of chances to customize the space to fit their needs. Residents love the great amenities and quiet, tree-lined streets that make for a perfect retirement oasis. Once completed, the clubhouse will serve as the central hub for neighbors to socialize. Here, residents will be able to gather for activities and club meetings in the social area or prepare a snack in the catering kitchen. A full exercise room will be on-site, making it easier than ever to stay in shape without breaking the bank. A theater and media room round out the proposed indoor amenities at Harvest Villas, stocked with the latest flicks to make sure residents here are never bored. Outdoors, neighbors will love the outdoor pool and spa for a relaxing dip, or gathering to catch up on the outdoor patio during the warmer months. Peterson Homes began construction on Harvest Villas in 2015, and when complete, this age-restricted community will be home to 76 attached residences. Homes here are available on a new construction basis and come in three different model types. These models range in size from 1,566 to 1,955 square feet. With two or three bedrooms and two full baths, these townhomes are the perfect size for retirees looking to downsize from a full family home. They also feature attached two-and-a-half car garages with additional space for storage. Life at Harvest Villas means having time to enjoy everything the community has to offer. Catch a movie with neighbors in the theater and media room or get to work on your fitness routine in the exercise room. Residents here are encouraged to form clubs and groups based on mutual interests, and to plan fun outings for everyone to enjoy. And with low-maintenance exteriors, homeowners here don’t have to waste valuable recreation time worrying about home maintenance. Harvest Villas is ideally situated in South Jordan, Utah. The community is just down the street from both Costco and Walmart, making shopping easier than ever. It’s also a short drive from a variety of local restaurants and shops. If you’re attracted to Utah retirement due to its natural beauty, South Jordan is the perfect spot, with trails and parks scattered throughout the town. And thanks to its location in the Salt Lake City area, residents are never far from the world-class entertainment options of the big city. 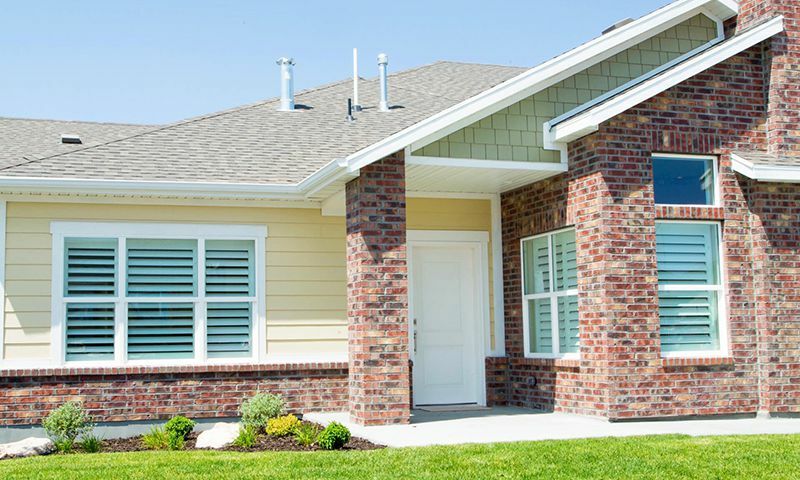 Top in quality and convenience, Harvest Villas is a retirement oasis in South Jordan, Utah. Check back soon for more information on the lifestyle in Harvest Villas. Peterson Homes began construction on Harvest Villas in 2015, and when complete, this community will be home to 76 attached residences. Homes here are available on a new construction basis and come in three different model types. These models range in size from 1,566 to 1,955 square feet. With two or three bedrooms and two full baths, these townhomes are the perfect size for retirees looking to downsize from a full family home. They also feature attached two-and-a-half car garages with additional space for storage. 55places.com is not affiliated with the developer(s) or homeowners association of Harvest Villas. The information you submit is distributed to a 55places.com Partner Agent, who is a licensed real estate agent. The information regarding Harvest Villas has not been verified or approved by the developer or homeowners association. Please verify all information prior to purchasing. 55places.com is not responsible for any errors regarding the information displayed on this website.